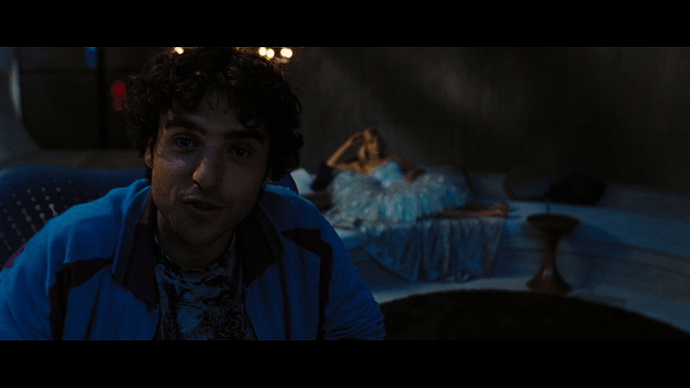 Is that the David Krumholtz Ex Machina? Is that the David Krumholtz Ex Machina ? No. It’s Oscar Isaac in Jurassic World. I haven’t quite finished the podcast, but I enjoyed the discussion around what type of video game this is, why fishing, etc. My overall sense watching the movie was that this was an existing video game the son was modifying, inserting the narratives of his family into that framework and adjusting the characters to fit. I could be completely wrong about that, there might have been dialog that clearly said he created the whole game. But I like my interpretation more if that’s the case (not that I actually like the movie or think it’s being clever either way). I like Tom’s observation about the dramatic camera movements and the idea that someone showed Steven Knight a 3rd person game and that’s what he took away from the experience. I noticed the camera, but didn’t think of that as an explanation at the time. Likewise I noticed car had the driver on the right, and the traffic lights changing “incorrectly”, but it turns out you drive on the left in Mauritius where Serenity was filmed (so presumably the driver is on the right). As far as some YouTube searching could tell me their traffic lights behave like the USA’s, but I think red to yellow to green isn’t unusual in some European countries, so that could also just be a weird production artifact that had no narrative meaning. So I think a lot of analysis of those details is pretty meaningless as far as identifying Knight’s true intent. I don’t think he knows enough about video games to be making specific and subtle references, but if he does, they don’t seem to be making any deeper point about the characters or observations about gaming, so they’re still indistinguishable from random quirks of production or empty style choices. I think someone gave Steven Knight a copy of Stardew Valley and he was briefly obsessed with it. If you’re not familiar with it, it’s a little “farming simulator” where you play a character who inherits a failing farm in a tiny little isolated town of a couple dozen characters and is tasked with restoring and managing the farm, helping the town folk with their little low key adventures and problems along the way. The main time sink is farming and farm maintenance. You plant, water, and harvest crops, gather materials to build equipment or buildings to improve your productivity, add animals to your farm, raise more valuable crops, etc. But there are plenty of other opportunities in the town for little adventures or exploration or gathering other resources. You can explore the mines, you can befriend or annoy the other residents, you can solve simple little quests for them, you can even pursue a romance and eventually a family with some characters. And of course, you can fish. Now just imagine you take that formula and just tweak the activity balance; what if instead of an isolated town it was an isolated island, and fishing was the primary activity with the farming dialed down to another side pursuit? Stardew Valley even has mod support, people already mess with the characters and personalize the game! That’s it, that’s Serenity! A kid works to mod Stardew Valley Island to insert his dead father into the game and pushes against the limits of the existing structure designed around pursuing your farming fishing career to write in a homicidal revenge fantasy. As far as some YouTube searching could tell me their traffic lights behave like the USA’s, but I think red to yellow to green isn’t unusual in some European countries, so that could also just be a weird production artifact that had no narrative meaning. I love this whole breakdown, Wholly. But I have to say that I will not explain away that detail as “a weird production artifact that has no meaning” because Knight makes a point of showing it to us in the frame. That is not an accident. It may be nonsensical, but that was edited in on purpose. Details like that don’t just happen to be left into a film. At any rate, I love your breakdown. I know someone who has played Stardew Valley a lot and I’m asking for her opinion as well. I like your take. BTW, have you ever had a fishing rod game controller? I have no trouble divorcing the idea that Knight wanted to show us that intersection from any significance of the specific way the traffic light behaved. That intersection was a part of Dill’s routine, it represented a decision and a tension between his original purpose and his new mission. The wait there for it to change, the fact that it was always (I think) coupled with narration from the omniscient radio DJ, I see that as all intentional, certainly. But that traffic light could’ve just been the one they had on the road they liked for that shot, or the one the props department got their hands on to install one because they liked the rest of the intersection. I say that with no authority or certainty, of course, but as an explanation I totally buy since I can’t see a way that red to yellow to green is a meaningful choice for anything else the movie does (or attempts). It was harder to swallow before I read that there are places with traffic lights like that. If the traffic light went from blue to pink before changing to a slowly pulsing red and white striped square of LEDs, I would have some questions. I would probably have different ideas if I was more familiar with Knight as well; if it was David Fincher, I’d be more inclined to think he screen tested several hundred traffic lights before settling on the right one. As it is, maybe it matters and I don’t get it, but maybe it only matters about as much as the color of Dill’s truck. The fishing controller was one of the few weird peripherals I didn’t own for the SEGA Dreamcast. I had the regular controllers, I had joysticks, I had keyboards, I had light guns, I had the microphone, I had the mouse, I had the Ethernet adapter, I had almost all the weird stuff. I just didn’t have the fishing rod or the maracas. I just didn’t have the fishing rod or the maracas. I’m saving this quote. I’m imagining Kellywand’s vocal response. My thoughts on the light and the whatnots were they were poorly thought-out examples of something that touches upon a Tom-ism from the movie Cop Car (I think). That being kid logic. I just saw it as Knight trying to fudge some ideas of a kid who doesn’t really know all of the facts of the world and thus messes up the game. I realize this doesn’t make sense necessarily, but I kept reaching for it. The thing is that they are the standard colors, just mounted wrongly. It’s not LED lights or pink. It’s standard, just wrong. I remember growing up in Virginia and finally getting my driver’s permit, which means of course that you have to drive with an adult. So I took my first excursion to the Patrick Henry Mall. Me in the driver’s seat. Dad in the passenger’s. I’d been to that mall a ton of times with my dad driving. Because passengers don’t always pay attention. So I can see a kid that age coding the lights and not paying attention to researching how they work. I think it’s a clue. I’m willing to admit I’m way off, though. I was grasping at anything to cling to at that point in the movie. I like the kid logic explanation for some things, like how the characters behave (and I totally understand the point about kids’ awareness of driving and traffic). It sounds like we’re still thinking differently about the origin of the game, I’m imagining an existing game the kid was just modifying, are you still thinking he wrote the whole game himself? That could be coloring my assumption too. And on that point, as I said, I’m not 100% sure my interpretation is valid. I started thinking about that too long after seeing the movie to remember with any confidence if the movie explicitly said one way or the other. It sounds like we’re still thinking differently about the origin of the game, I’m imagining an existing game the kid was just modifying, are you still thinking he wrote the whole game himself? I am still thinking that. But keep in mind, I am VERY limited when it comes to gaming. The last game I really played hard was Far Cry 2. And the only game I continue to play now is Rock Band 3. Which Tom refuses to even consider a game! So don’t trust my interpretation at all. I like the mod idea you are floating. I just cannot speak to it specifically. If that is the case, I really don’t know what audience Knight thought he was targeting in making this movie. If I can’t pick up on that as a casual (to put it mildly) gamer who does a podcast on a gaming website, then what chance does the general audience have? I started thinking about that too long after seeing the movie to remember with any confidence if the movie explicitly said one way or the other. Which point you make here. And I think you’re right. Which is one of the huge problems with the movie. It’s the I’m-looking-at-news-crawls thing since following the characters has started to bore you. Pondering this question is what made this whole bonkers movie worth seeing for me. Or that would’ve been enough at least, if I wasn’t also blessed with a Qt3 podcast episode. Have I mentioned how much I like this forum? Anyway, I hope someday there’s a documentary about video games with a whole section on Rock Band so I can tell Tom it’s my favorite movie. Wait, did this film make Tom want to play the Sims? I am still sad but I would understand. Yikes, I didn’t even make the connection, but I think you’re right. I was incepted by Serenity! This was a bad movie I was glad I saw. I can appreciate an ambitious failure. @ChristienMurawski You should get a hold of Tom’s Red Dead Redemption II save and go fishing some time. It’s a very relaxing experience.